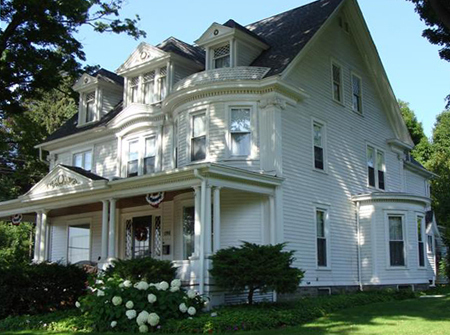 Rediscover the art of relaxation at this 1901 Queen Anne style bed and breakfast located in the heart of the beautiful rolling countryside of the Endless Mountains Region of Northern Pennsylvania. The full 3 course gourmet breakfast is served in the sunny and spacious formal dining room amidst a relaxing and romantic atmosphere of candlelight and music. All five guest rooms of this turn of the century home are beautifully furnished with Victorian antiques and reproductions of a bygone era. The Golden Oak Inn is widely commended for its memorable cuisine and unrivaled hospitality. It truly is an unforgettable experience. The Golden Oak Inn Bed and Breakfast is a member of the Endless Mountains Visitors Bureau, Pennsylvania Route 6, and Troy Chamber of Commerce.